Design Manchester was created to provide the voice of design in and connected with Manchester. We are a not-for-profit organisation running events and programmes throughout the year. Our headline activity is DM, the annual design festival for the city, which takes place every October and is now in its fourth year. Design Manchester was established in 2013 with the support of Manchester School of Art, part of Manchester Metropolitan University, which remains a key partner. The highlight of the first festival was a day of presentations by designers from Manchester and around the world in the Town Hall. In 2014, Design Manchester linked up with the Science Festival and also attracted thousands to an exhibition of classic trainers by adidas Spezial. That year also saw our first public design debate. 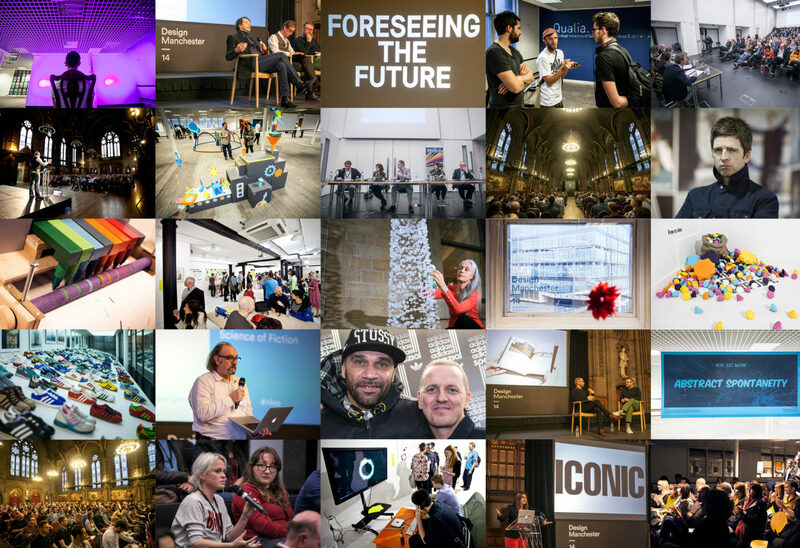 in 2016, Design Manchester’s annual festival more than doubled in size and attendance. More than 40,000 people attended 35 events over ten days, presented by 300 artists and more than 100 volunteers. Over 7,000 interactions across 3,500 Twitter and Facebook accounts gave the festival as a whole a potential reach of nearly 17 million, an increase of 400% year on year. Online and printed media carried at least 78 pieces of coverage creating 80 million opportunities to see. Creative Review, Design Week, the Manchester Evening News and Computer Arts – among many – were incredibly supportive of the festival. The events include exhibitions, showcase presentations, a film series, live performances, workshops, community programmes, a design fair and the annual debate. Download Document 15 and Document 16 to read more about what has inspired our festivals in the past two years.. The work designers do is used by everyone. Design Manchester is for established and emerging designers, creative professionals, students, public services, industry, families, young people and old people in all of Greater Manchester’s diverse communities, as well as visitors from across the region, the country and the world.